Examples of the trucks (not the actual vehicles) I drove in the USA. Over the road trucking for CDB Inc. meant delivering dry freight from the Amway World Headquarters, Ada, Michigan to distribution facilities in Jamesburg(? ), New Jersey; Atlanta, Georgia; Arlington, Texas; Portland, Oregon; and Santa Ana, California. Note: With exception of the first White/Freightliner on the left, I was consulted as to the type of tractor I thought would be most efficient for Progressive Heat Treating. I chose COE because of manoeuvrability and visibility. As the lead and often the only driver, I was responsible for driving, record keeping (miles travelled & fuel used per state), truck maintenance, and filing 'road tax' forms in four states quarterly. To facilitate the record keeping and tax payment, I designed and implemented a data collection application using Lotus123(dos) spreadsheet running on an IBM PC AT. Whether this had any significant impact on the corporate bottom line I may never know. You may notice that while I was with Progressive Heat Treating I drove Detroit, Cummins and Mack diesel engines. Thanks to Brad Nelson's Tales of a Hay Hauler: 'Old Iron' here is a brief description of the different driving techniques demanded by Detroit diesels and Mack's Maxidyne engines. Cummins fell somewhere in the middle. For a brief period during the 1980s and 1990s American truck drivers enjoyed truck-tractors with maneuverability and visibility comparable to European trucks. 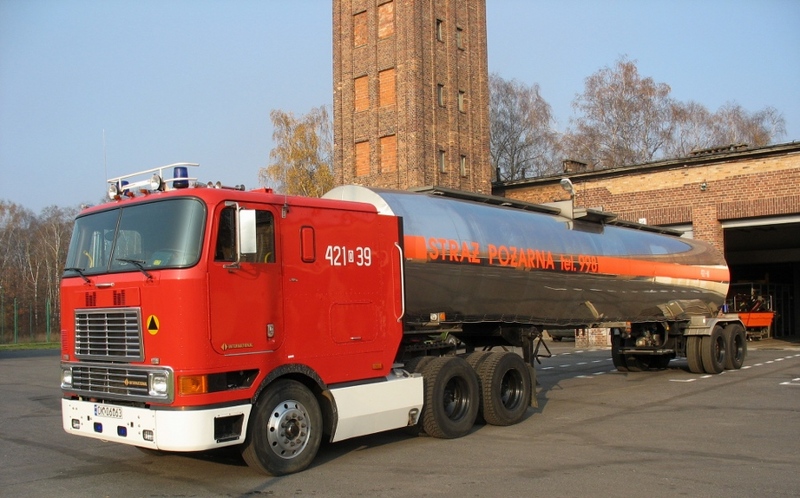 After the full effect of the Surface Transportation Assistance Act (STAA 1982), removing over-all length restrictions for combination vehicles on the "National Network" (which is comprised of the Interstate system plus the non-Interstate Federal-aid Primary System), worked its way through the transportation industry most American truck manufactures withdrew their line haul Cab Over Engine (COE) models. Trucking: Cabovers, back when trucking was trucking (by trucker5933). To the song "Prisoner of the Highway" written by Mike Reid, and recorded by Ronnie Milsap. Tribute to The International 9700 and 9800 COE (by Gear_Jammer24). Pictures of American made International/Navistar 9700 set-back axle COE. Note: many 9700s where sold abroad after being taken out of service in North America. Progressive Heat Treating Co, 341 Grant St SW, Grand Rapids, MI 49503, specialised in the heat treating of carbon steels, using the austempering, martempering and normalizing processes. Progressive was founded by David Gaylord in 1976, and he served as its president until the company was sold in 1999. Since Progressive was a small shop it was able to stay non-union and paid approximately 75% of the prevailing union wage. Progressive operated 24/7 manned by less than 20 employees with seldom more than one truck on the road. "On 15 April 1999, the Bodycote Group the Worlds leading supplier of specialist metallurgical services acquired the entire issued share capital of Progressive Heat Treatment Company ("Progressive") of Grand Rapids Michigan for a total consideration of US$3.9 million (£2.4 million) which was paid in cash. Progressive was founded in 1976 and provides austemper continuous furnace heat treatment for a range of automotive, furniture and stamping industry customers throughout the Great Lakes area. Profits before tax for the year ended 30 November 1998 were $1.1 million (£683,000) on turnover of $3.2 million (£2 million). The net assets acquired amounted to $766,000 (£476,000)." An aside: Heat treatment, the worlds oldest industrial process. If I wasn't willing to work weekends, the hiring of a part-time driver to operate (my?) truck. After sixteen years I wasn't thrilled about sharing my "office" space. I heard over 10,000 times. Since my late wife, Gail, and I had moved closer to her job in Lansing, Michigan in 1988, I had been commuting 110 miles per day plus upwards of 400 miles in the truck. Working weekends really wasn't an option. My studies in Microcomputer Support encouraged me to go online just as the World Wide Web was beginning to take off. As I used the Web more and more for research into my many and varied interests I discovered some disquieting data about my life's career as a truck driver. Truckers are not included under the Fair Labor Standards Act, therefore carriers are not compelled to pay them an hourly wage. "Truck drivers were fatally injured on the job more than any other individual occupation." ~ Bureau of Labor Statistics, U.S. Department of Labor - NATIONAL CENSUS OF FATAL OCCUPATIONAL INJURIES IN 2000. Starting in a truck of 80,000 lbs. Gross Combined Weight. Ending in a truck of 121,000 lbs. Gross Combined Weight. This transition to larger capacity equipment occurred as the result of extensive lobbying on my part to allow us (the company) to keep one of our larger customers by increasing transportation productivity as opposed to a rate decrease proposed by the customer. As a result of my efforts I suffered ostracism by the other company drivers for 6 months. And even though I was moving 50% more freight each day and had a perfect work attendance record, my employer could not see any reason to increase my salary. Even a stubborn truck driver eventually knows when his services are no longer appreciated. Thanks to Google Street View, here is the actual truck. AAA study reveals car drivers cause most fatal crashes with big trucks. Canadian Driver July 24, 2002. And it is getting worse. 80 percent of car-truck crashes caused by car drivers, ATA report says. By James Jaillet	@trucknewsJJ	on February 14, 2013. Most curious of all, it is usually the car driver who suffers the fatal consequences. When does courage become stupidity? With truck driving among the ten most dangerous jobs in the USA I decided enough was enough.